Publishing and public acess are set in the Publishing tab in Guidelines settings. Publishing different versions and making a guideline public is two different things on our platform, even if they are often used as synonymes elsewhere. You can publish many sequential versions, for internal review, for peer review, for safe keeping or to keep a stepwise version history. But, it is not until you decide to release it for public acess that the versions become publically available. You can look at it as printing a book. You can print/publish 100 copies of it, give out to friends and family, or store in your garage. But it's not until you put it in a store or place it on the internet that it is available for the public to read. When ticking off for 'Public acess', all users on the internet can find your guideline and read it. If you change your mind or need to withdraw the guideline from public view, you simply un-tick the 'Public acess' and the guideline will no longer be able to be found, opened or read. Published versions gets numbers based on their order and whether it was a major or a minor version. Major versions are called v1.0 - v2.0 - v3.0 and so on, while minor versions gets increased numbers after the comma, like v1.1 or v2.1. We suggest you use minor versions (v0.1, v0.2...) in initial development phase, so you can publish a major version v1.0 as your first public version. You can make a comment about what is updated, or its implications, every time you make a new update/new version. When you publish a new version, the old is placed in version history. A PDF and a data file is also automatically made available. The new guideline is marked with a green label containing the date of publishing and version number. The old guidelines are still accessible and they are marked with a red 'Outdated' label. When publishing a new copy, you always keep your draft copy that you can edit further. It is clearly maked with a gray 'Draft' label. From the current version you can go straight to your draft by clicking on the 'Edit' button next to the green label of the current version. 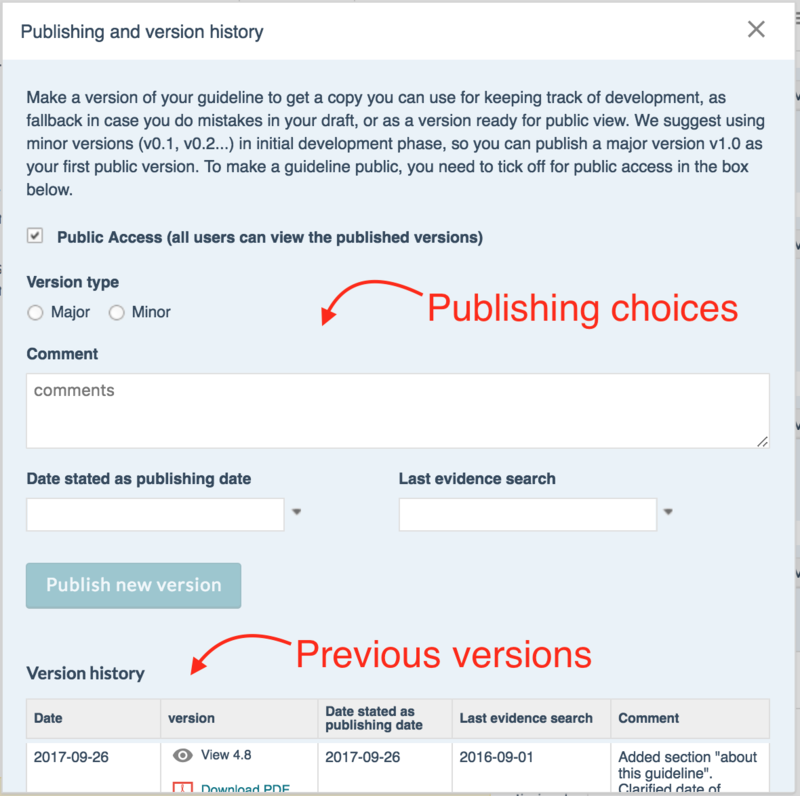 You and your co-authors and co-admins can access both your draft and your most current published version from the main page.You can access the version history from within the Publishing and Version history dialog in guideline settings. Only organization administators can publish guidelines affiliated with their organizations. A normal organization can add a total of 3 adminstrators, by accessing the members-tab on the organization settings page. If you need more than 3 administrators, contact us.